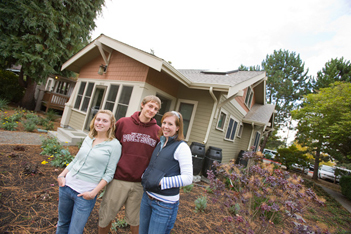 Theme Houses at Puget Sound are designed to create intentionally engaging living environments for sophomore, junior, and senior students. Students have the opportunity to live together with peers with common interests such as academic majors, athletics, foreign language, outdoor exploration, healthy living, and other activities. Our goal is that the selected theme houses will each make unique contributions to the campus living through their presence on campus. Each Theme House has a student coordinator who will serve as a liaison to Residence Life. House members are expected to be involved and active in the campus community. A faculty or staff member advises each the theme house members in their efforts to support and connect with students with similar interests. If you are interested in living in one of these theme houses contact Residence Life by December 1 to be connected with the faculty/staff advisor of each house.